The moments surrounding the entire exhausting day are still spinning around aimlessly in my head. 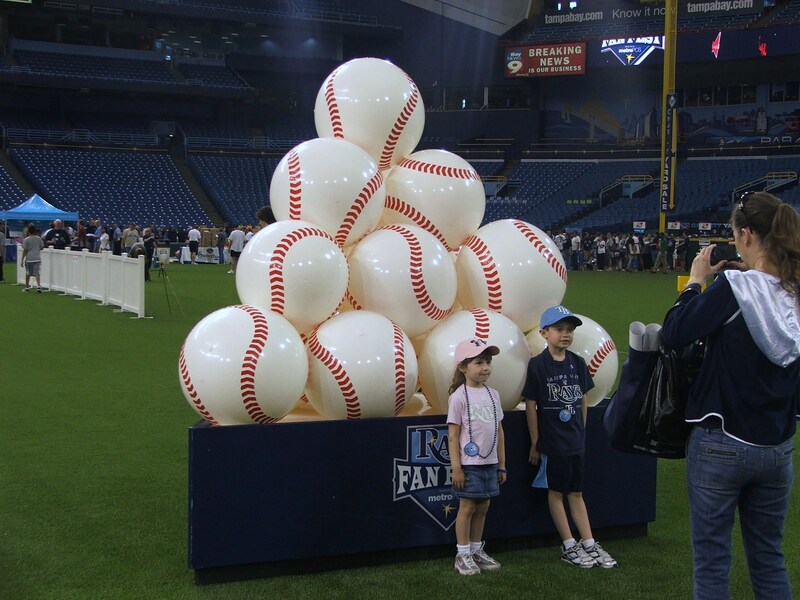 Pulsating through my eyes and ears still are the photographic moments, enthusiastic greetings of baseball friends, and again hearing a buzz engulfing Tropicana Field. The last time I sat in this stadium, another team was celebrating. Today it was to again witness a seasonal rebirth, a reincarnation of the recharging baseball spirit. It was time to get our collective baseball on! 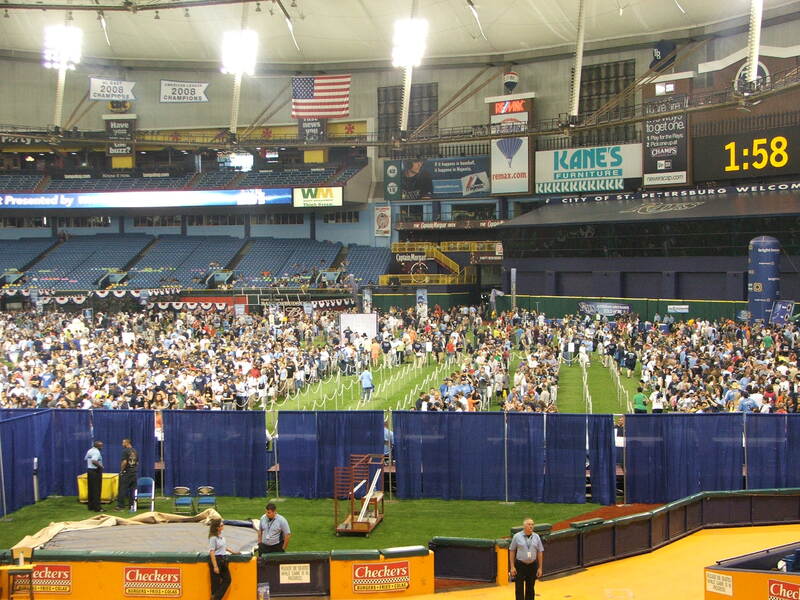 When the doors finally were thrown open as a symbol of a new Tampa Bay Rays season, I was overcome with a emotion of the expectations, the unforeseen, and the grandour of another season “officially” being kicked off along with 25,000 of my fellow Rays fans. 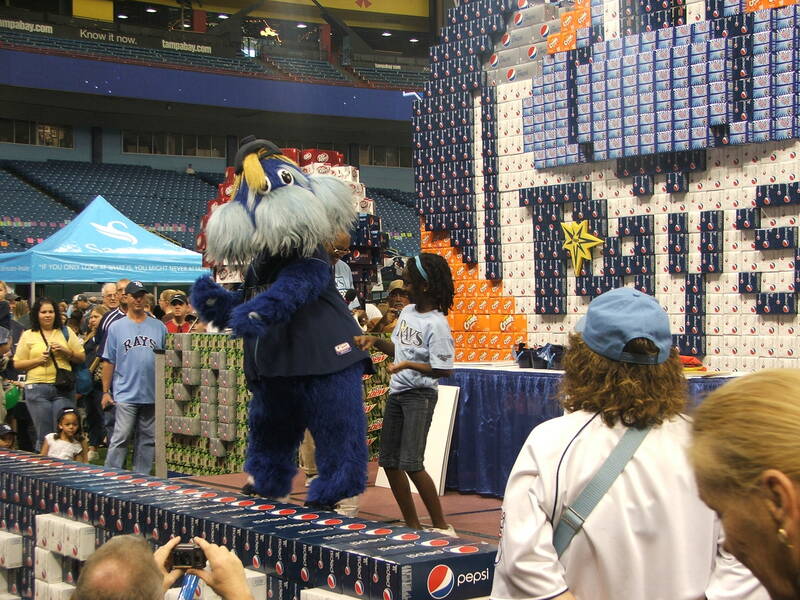 As I first rushed in from Centerfield, a Pepsi monstrosity met my eyes. 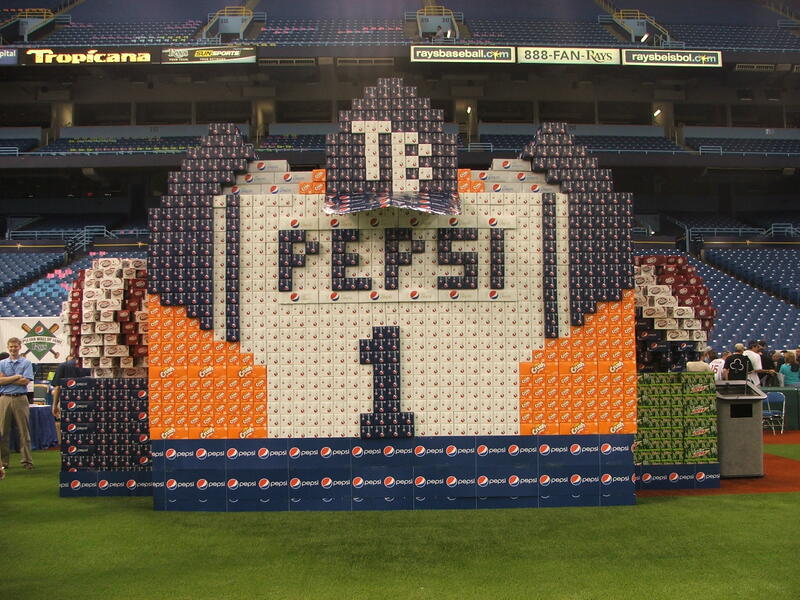 I was the first Pepsi person to build a display for the Rays/Pepsi Fan Wall of Fame 7 years earlier, on my own induction day. Before me stood a wall of power, agility and almost 20 hous of labor. But it was a labor of baseball love, and bigger than anything I could of ever imagined. Then out of the corner of my eye was the object of that day’s affection for me. 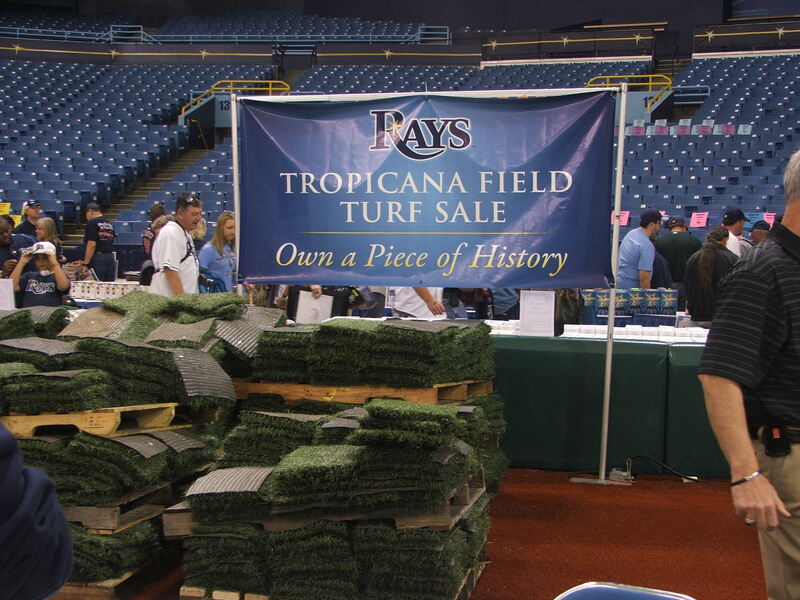 There on pallets stacked almost 4 feet tall were 1 foot square parcels of the old Tropicana Field FieldTurf. The same turf that saw champagne dripped on it in 2008 and again in 2010. 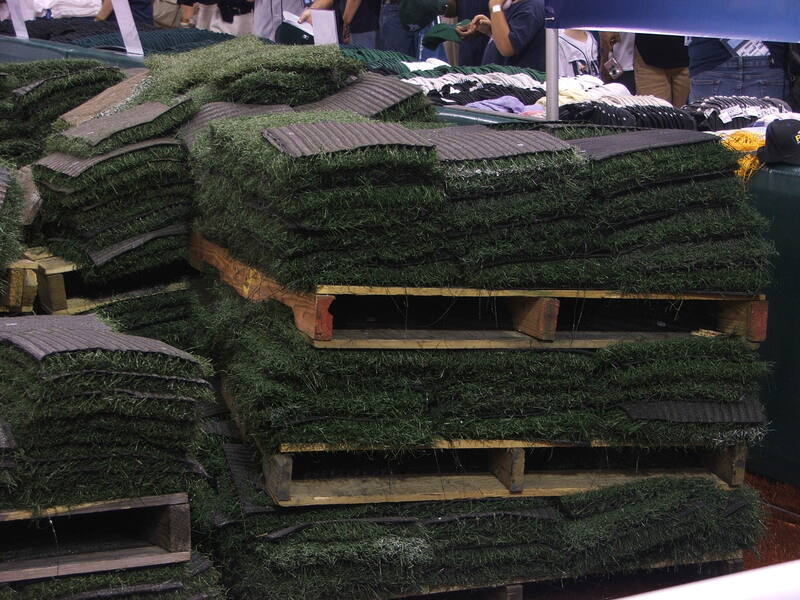 The same turf that was in place during the first Rays No-hitter in 2010 by Matt Garza, or the first Rays cycle by B J Upton in September 2009. So much history had been spilled both by sweat and celebration on that dark green carpet. 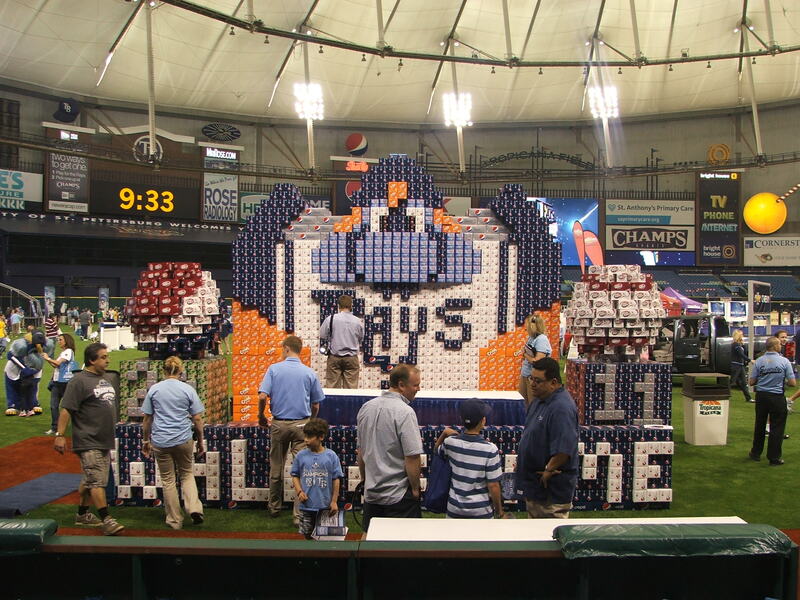 Now it could be all ours with a $ 25 donation to the Rays Baseball Foundation. A small price for something that holds so many memories in its fabric. So much to do during Fan Fest, and so little time. I decided to take astroll back towards the Centerfield entrance and view again, the Rays Holy Grail, The 2008 American League Trophy.stood before me with a brilliant Rays inspired background. To this day, that trophy still has a special allure,and makes me want to embraced it just like I did back before the 2009 season. 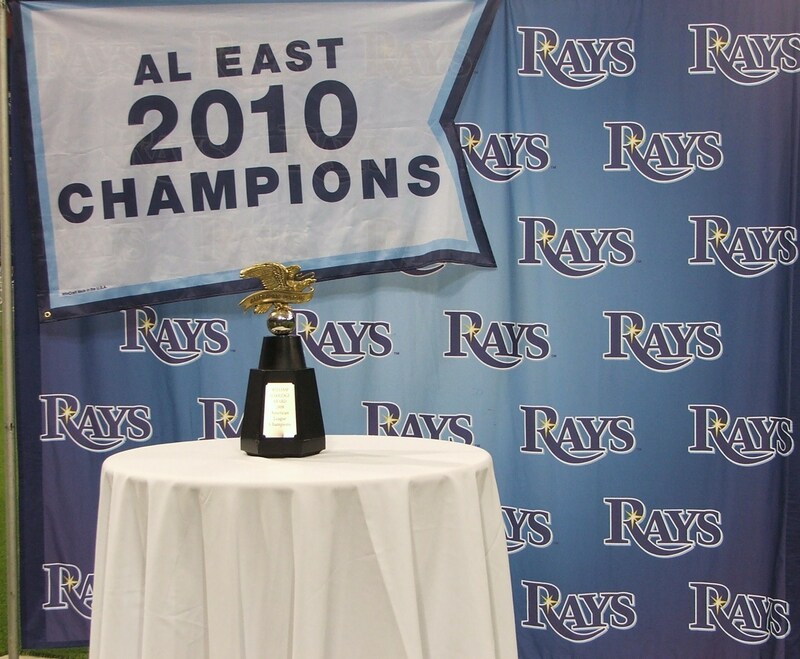 But this time, it was out there front and center for all Rays fans to also celebrate and have their photos taken with this glorious piece of hardware. 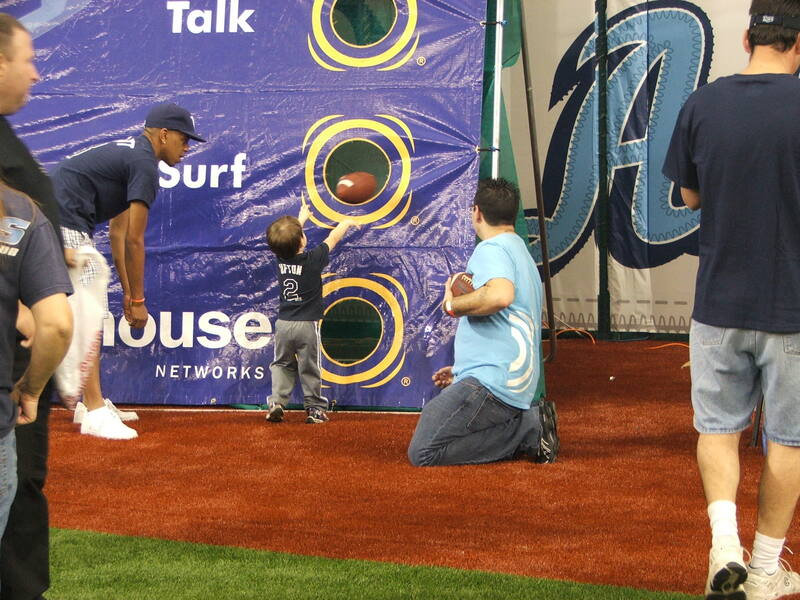 That is what Fan Fest is all about…possibilities. 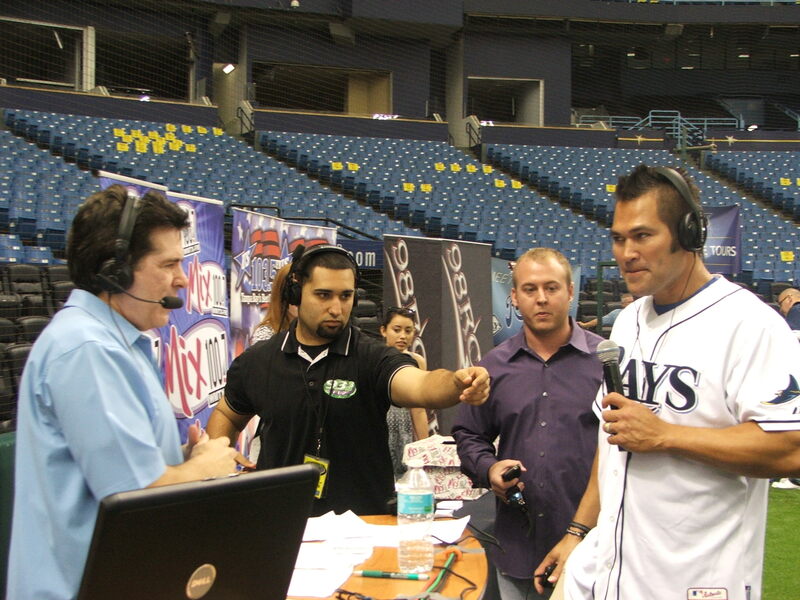 Suddenly my eyes began to refodus towards Home Plate, and lo and behold stood new Ray Johnny Damon dressed in a “22” jersey giving a high-5 to a young Rays fan who had just finished running the bases. 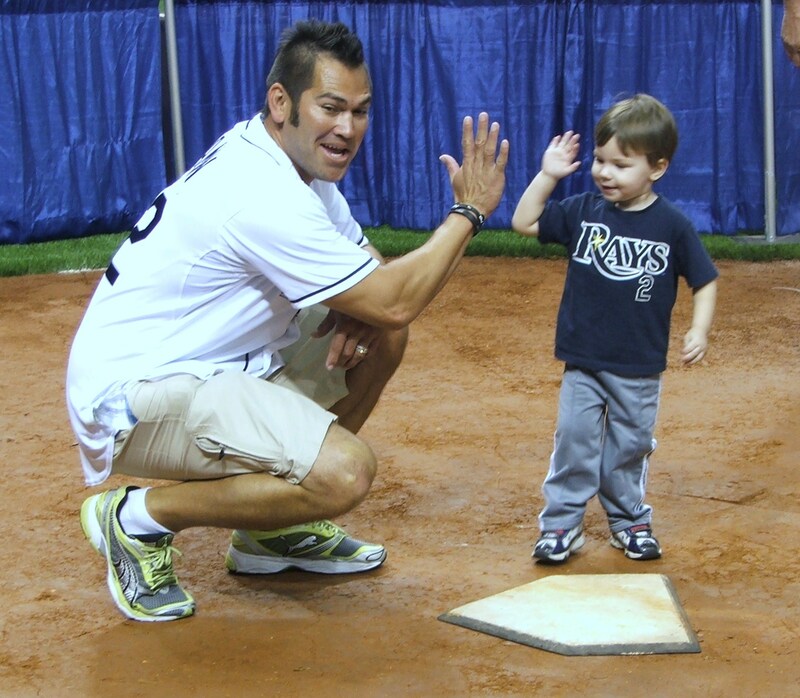 It was great to see new Rays Johnny Damon take some time out of his busy day to come greet a few special Rays youngsters as they crossed the plate. Damon had a prior committment that day and only had a few moments, but a few kids will get a moment that will be cherished when they get older. Thank you Johnny! 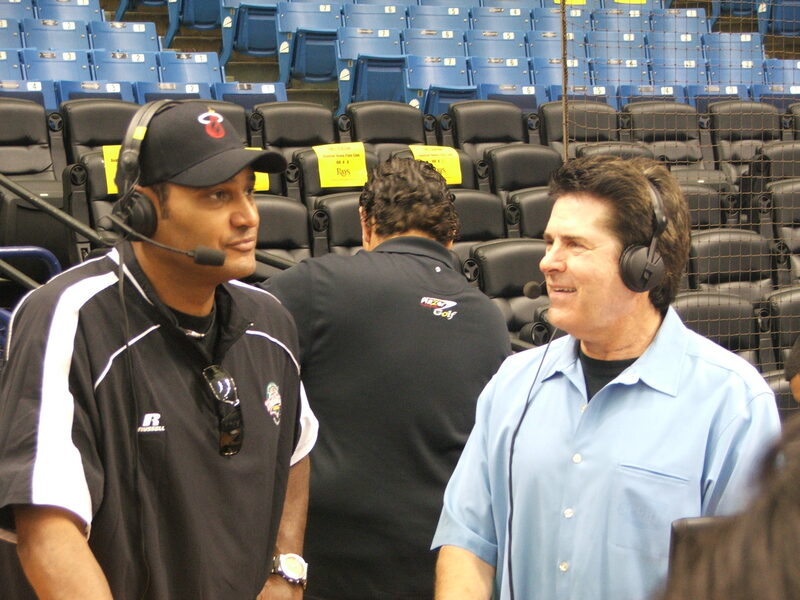 I spent a few moments listening to Damon during his radio interview with local Brighthouse Sports anchor Rock Riley before taking a trip down “booth row”. 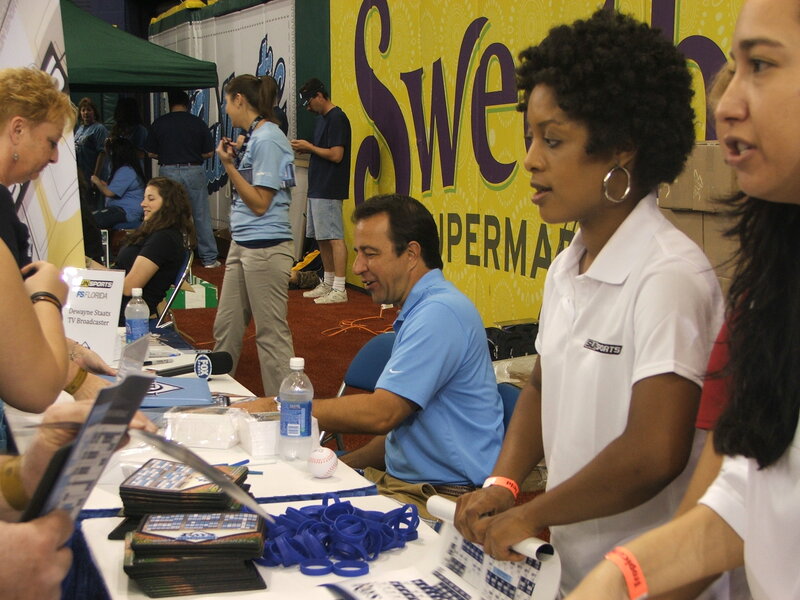 This houses all the radio station, special promotional partners of the Rays, plus the Rays club tables. 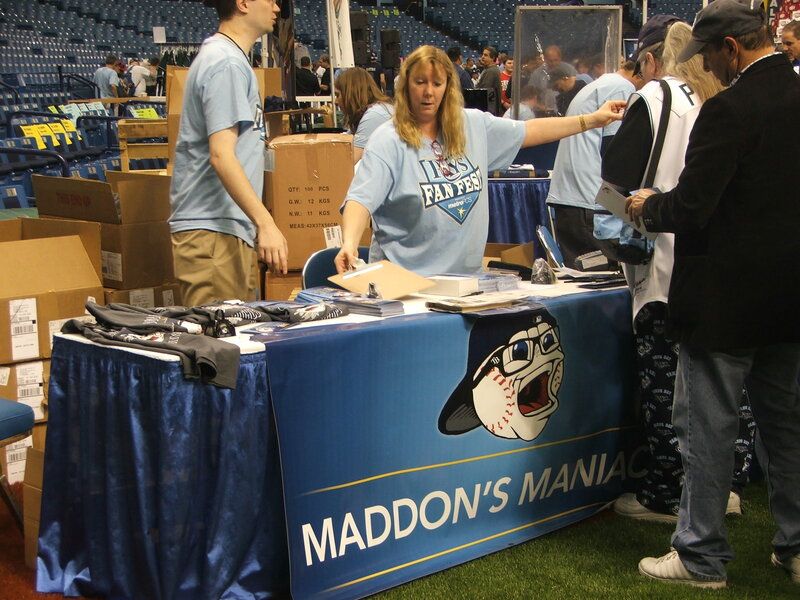 I stopped by the “Maddon’s Maniac table and met for a fewmoments with coordinator Matt Fitzgerald looking at the new 2011 gray “Maddons Maniac” design. Fitzgerald also pointed out the new dark blue T-shirts for the “Golden Rays” (over 55 Rays) which also had a beautiful new “GR” insignia on the design. Both designs were amazing, and sure to be popular Trop items this season. After a quick check-in at the Wall of Fame table to let them know “Mr. Lucky” from the class of 2004 was in attendance, I was off to the Yard Sales of all Yard Sales located in the Corona Beach area in Leftfield, and also out in Leftfield Street in the stickball court region. Used game jerseys from the past, including the 10th Anniversary jerseys were going for only $ 100. Along with signed balls, used bats and even a few other momentos most would have thought long gone. 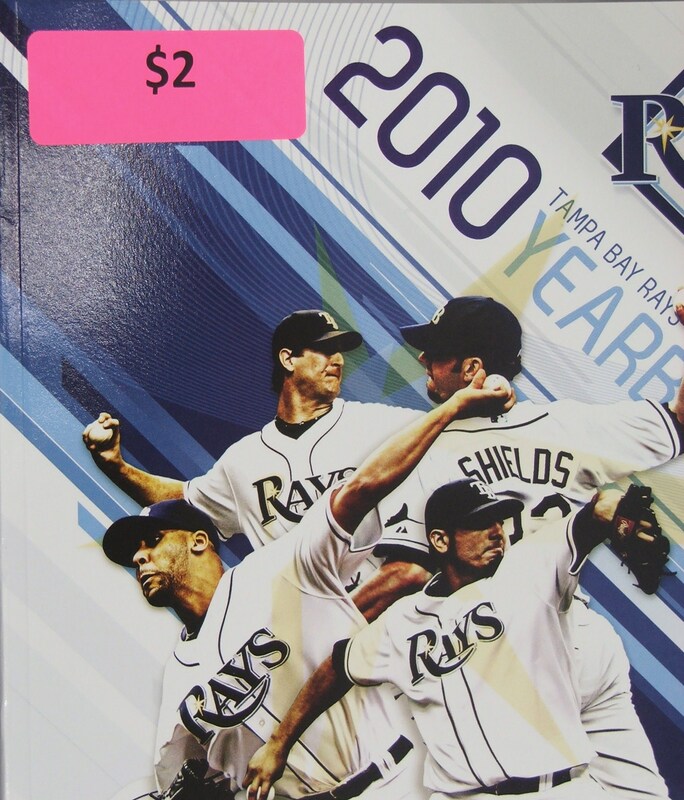 A 2010 Rays Media Guide, Yearbook went for the unheard of cost of only $ 2 (they cost $ 20 in the Team Store during the 2010 season). 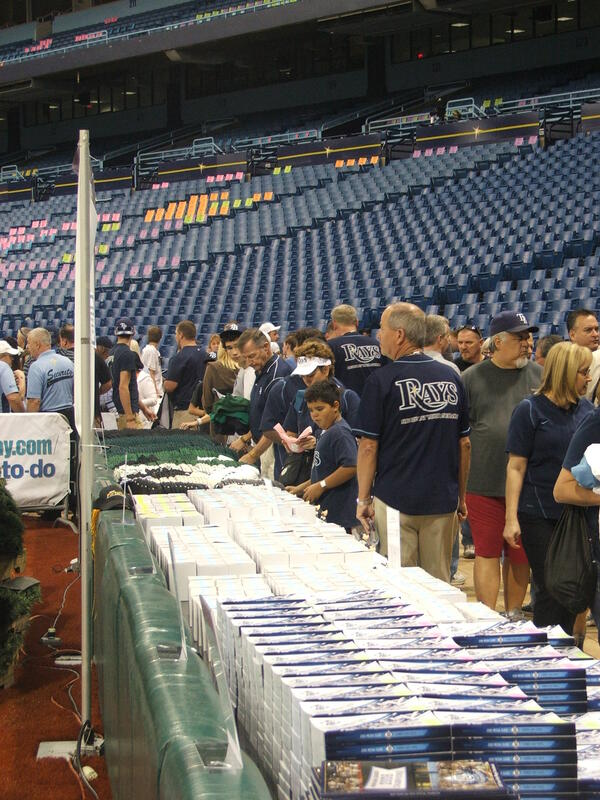 Buyers were everywhere getting some of the best Rays deals, and also helping the Rays Baseball Foundation. I took another lap around the stadium watching as kid’s played numerous games from a speed trial while running from first to second base. 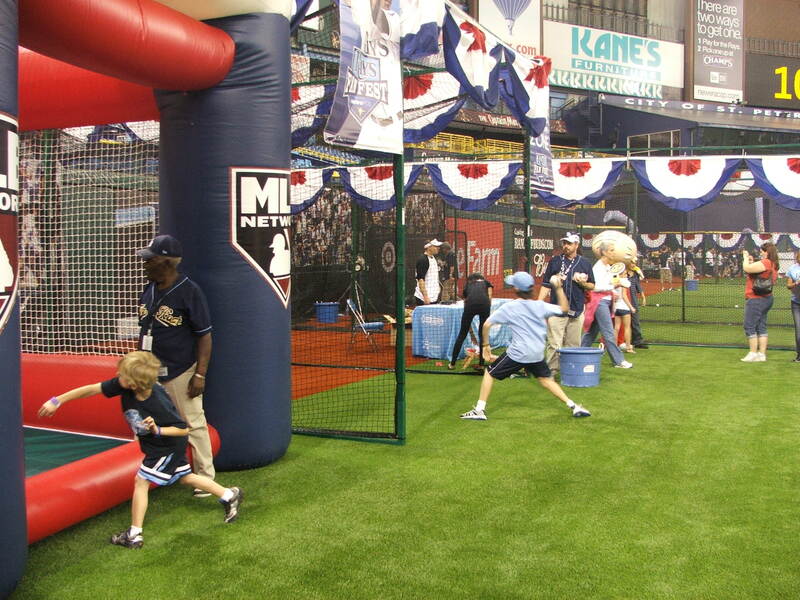 A wiffle ball Home Run Derby area that looked like Ebbets Field, plus the always popular pitch speed booth where young hurlers could see if their velocity had improved over the Winter. 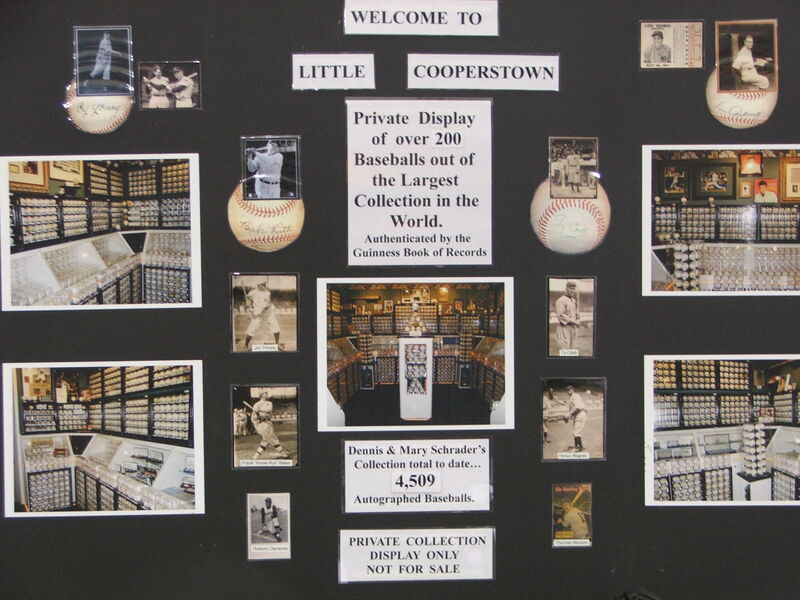 Took in the numerous vendors selling Rays merchandise along the curve of the infield clay and also experienced a small sampling of the “Little Cooperstown” baseball display that an avid Rays fan has assembled throughout his life. 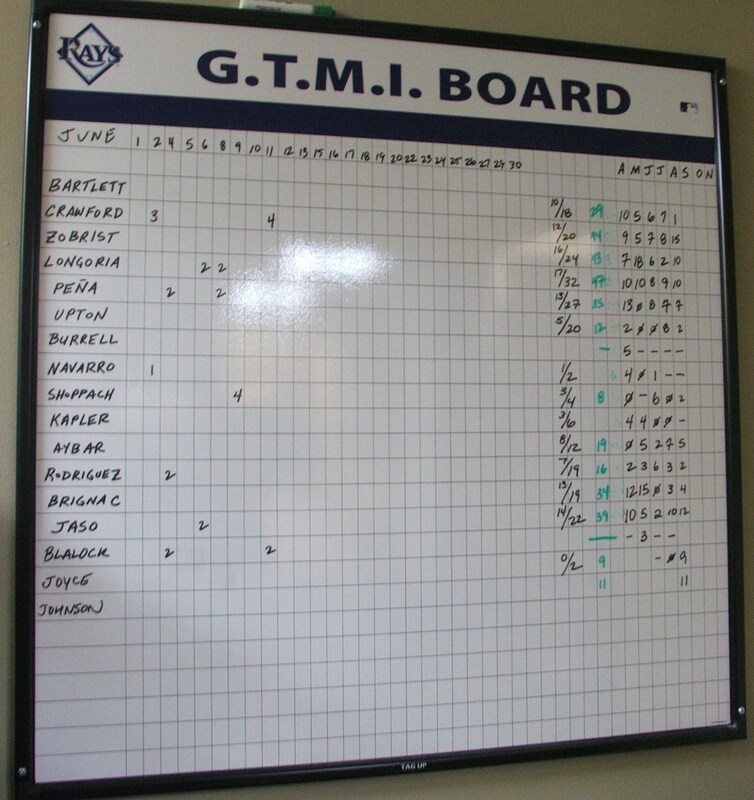 Took the yearly visit through the Rays Clubhouse where I got to see the now famous GTMI Board. GTMI stands for “Get The Man In”, which Maddon stressed profusely during the 2010 season. Those 4 letters might have been a small catalyst that eventually got them the Rays second American League East title in three seasons. 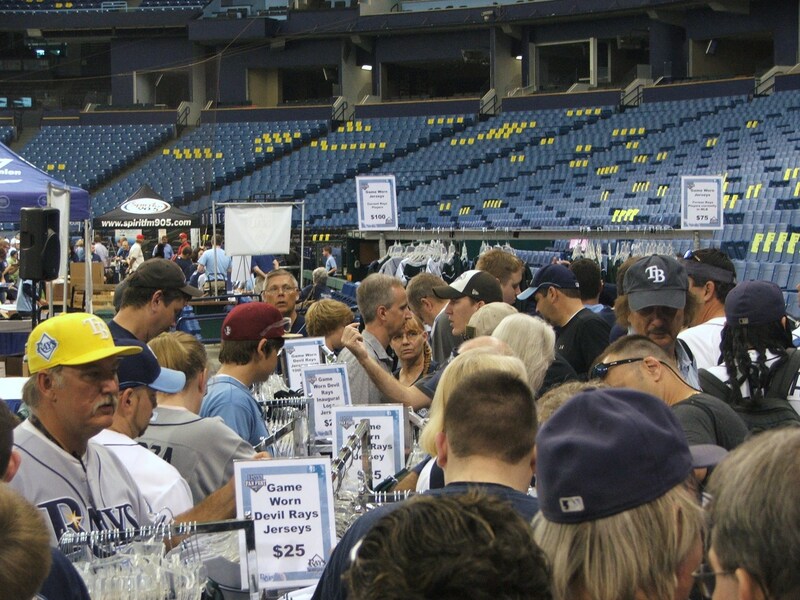 It was only a little after 10 am and already the autograph line was getting full for the 12 pm signings for Evan Longoria (Table 1) and B J Upton (Table 6). I strolled around the ballpark a few more times even hitting “radio row” again, plus the Fox SunSports table where roving television reporter Todd Kalas was signing for fans. Kalas was at Fan Fest for a long time today considering he had to do a telecast for the USF Bulls Basketball game that evening. That just shows the dedication goes beyond just the players for this event. 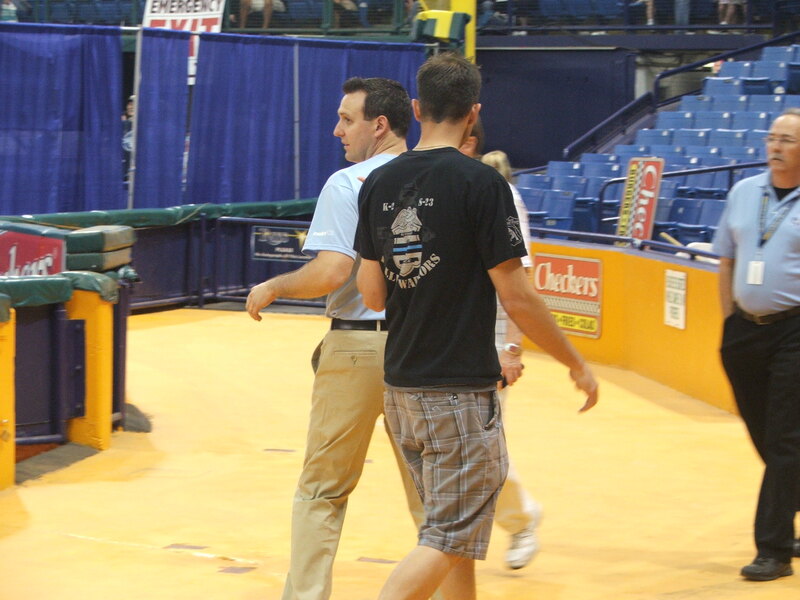 Before he left that afternoon, Kalas had stripped off his Carolina blue Fox/FSN polo shirt and reappeared in a dress shirt and tie ready for his departure to USF. 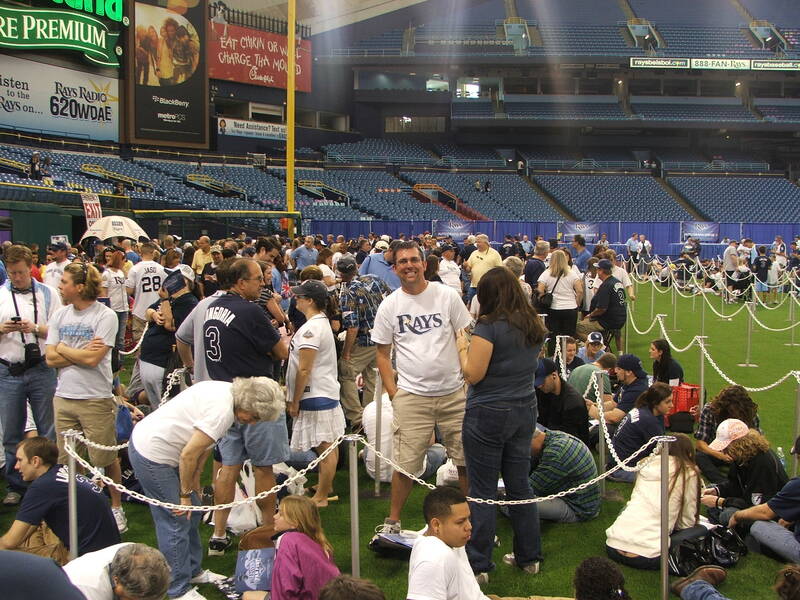 But the mood was upbeat and extremely enthusiastic all over the stadium about this 2011 Rays team. 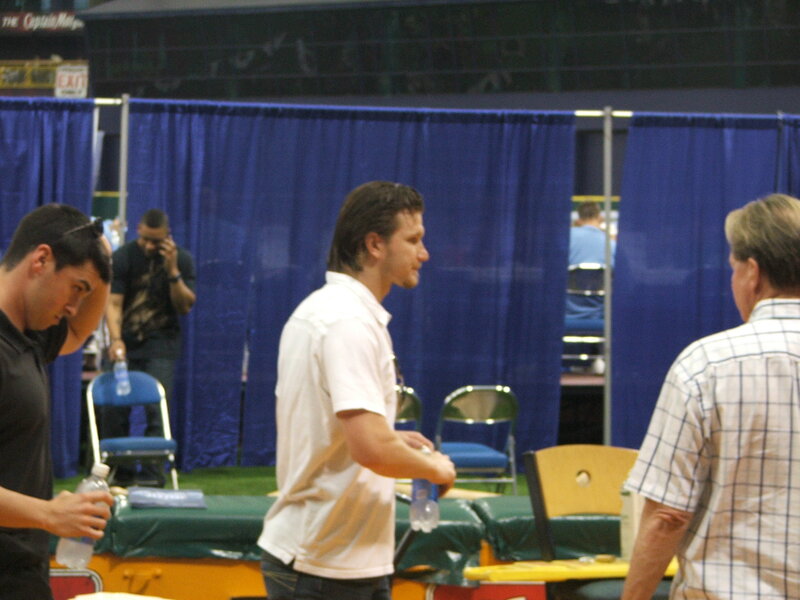 It was now about 12 and Longoria and Upton had not arrived yet to the Trop. Seems there was an accident on I-75 coming Northbound. For those who do not know, the I-75 corridor from Palmetto to Naples is under going some construction and repair work to widen the highway. One section of I-75 North was already 2-lanes before the accident. Afterwards it pushed everyone into a single lane for a short distance, which backed up traffic for miles. I took another lap around “Radio Row” which was just in front of the Rays home dugoutnear the area between the two dugout. 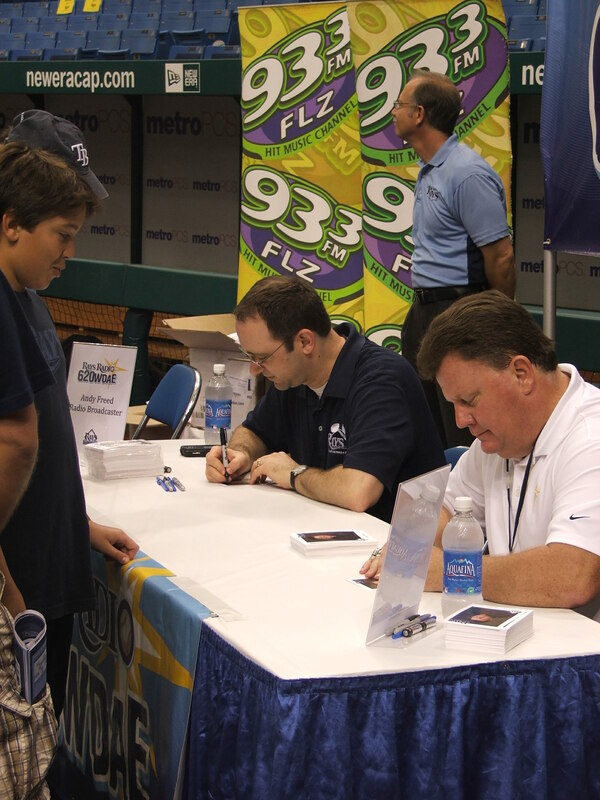 I made sure to stop by the Rays Radio Network table and congradulate Dave Willis on his recent 3-year deal to stay as a voice of the Rays. In front of the visitor’s dugout was the MLB Alumni signing tables. 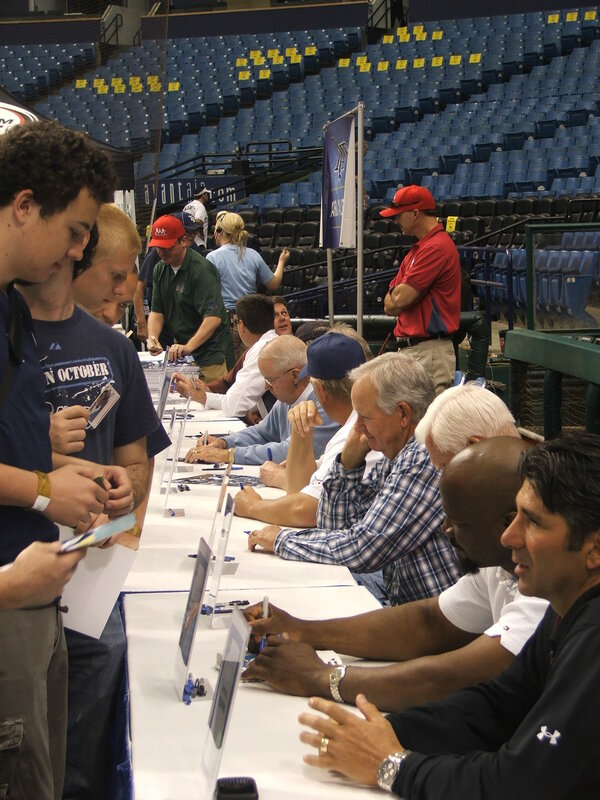 There event featured 40 former MLB players signing FREE autographs for the fans. I was looking forward to seeing ex Rays Dave Eiland (now a Rays Special Assistant), OF Jason Romano, and relievers Roberto Hernandez and Travis Phelps. Hernandez was accompanied by his young son, who also is a local budding baseball player. But I was intriqued to see Phelps wholast pitched a few years ago for the Tigers in the Spring. People forget he is always going to hold a distinctive record in MLB history. Phelps was drafted by the Rays in the 89th Round of the 1996 MLB Draft. No one else…ever will make it to the MLB level from that spot. 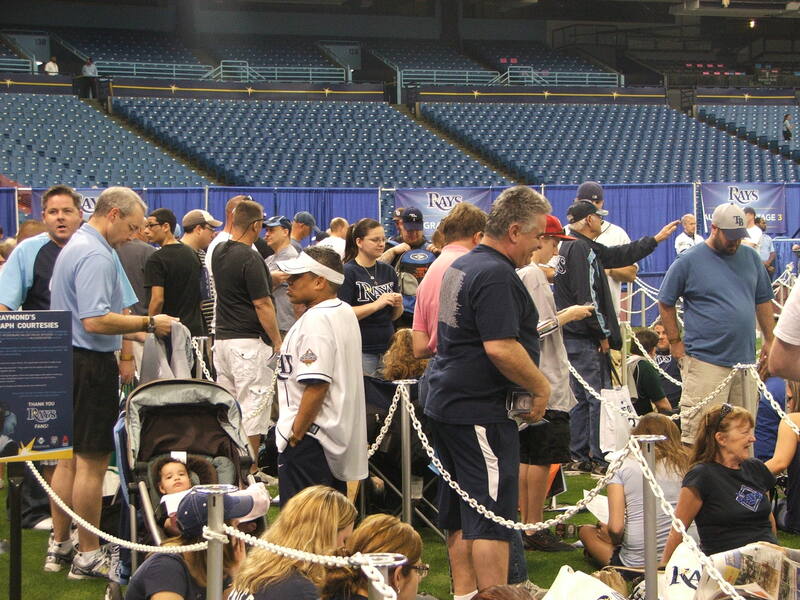 It was now around 12-ish, and Evan Longoria and B J Upton had not arrived yet for their 12 pm signings. Word spread quickly back behind the blue curtain that an accident had traffic backed up a bit on I-75 coming North from Port Charlotte,Florida. The Rays were enroute, but were delayed by traffic. The section of road from Palmetto to Port Charlotte is undergoing a huge upgrade in lanes and interior changes. I know from traveling the route just a few days earlier that not paying attention could cause a huge mess. Finally both Upton and Longoria arrived and began signingfor the fans. The 1pm and 2 pm Rays players also had a bit of a delay, but it was much less than the huge time lapse of Upton and Longoria. Rays RP Andy Sonnanstine also wore a T-shirt honoring the two slain SPPD officers during his Season Ticket holder photo op, and his panel discussion with fellow pitcher Jeff Niemann. J P Howell took a moment to chat with me before heading off to do his photo opportunity with Sonnanstine, then do his “Reading With the Rays”. Even with a few bumps in the road. 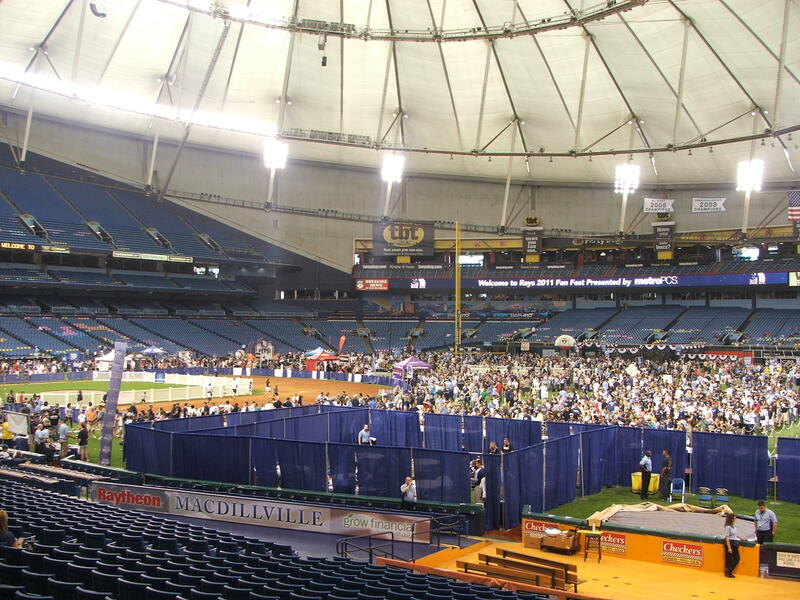 The new AstroTurf at Tropicana Field brought about some comments as to its “bumps”, but after 25,000 pairs of feet, plus the upcoming gymnastics event and St. Petersburg Boat Show, the turf should have settled a bit more in place. No matter what, Dan Moeller and his Rays groundscrew will have theTrop surface in tip top shape before the Rays final Spring Training game on March 31,2011. 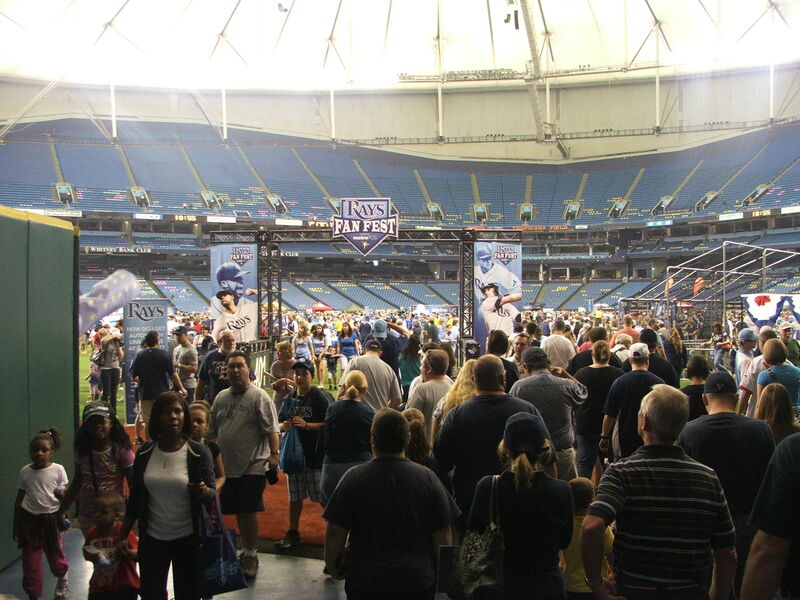 The Rays Fan fest attracted 25,000 Tampa Bay fans. It also helped raise over $100,000 dollars for its affiliated charities through donations and the Yard Sale. It was the perfect ending to a great day of celebrating the upcoming season, plus remembering those less fortunate in our community. 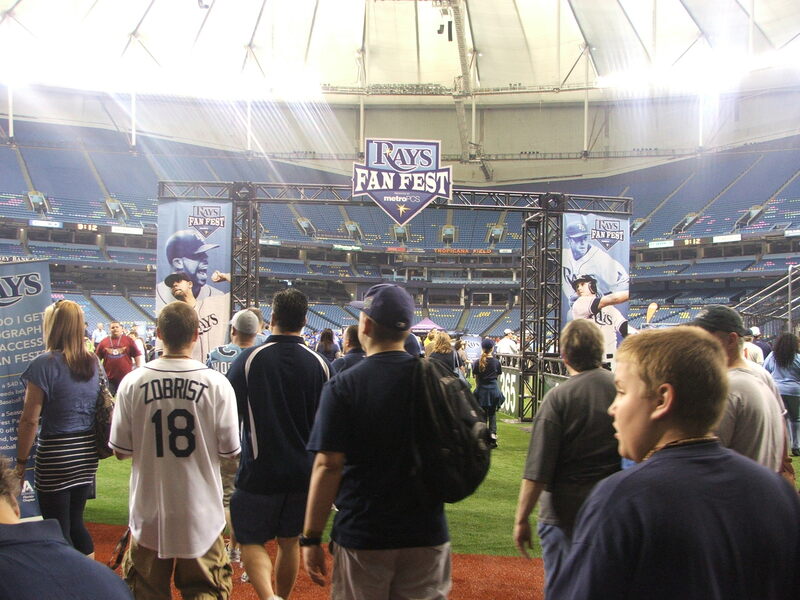 Once again the Rays showed they know how to throw a Fan Fest. Sure there were a few flies in the ointment, but that will only make the Rays staff work harder to bring another great event in 2012…I can’t wait! Awesome pics. It must have been a great experience. Very cool. As a fan, I’d love to be a part of that. Maybe that’s the Rays’ business model. Spend little money on players, spend a lot on the fans. Not bad. Also had a lot of local bloggers and fans who read my Tweets come by and say “hello”. And that was a secondary cool thing. You read or write things in 140-characters for so long that the personal side something disappears and you see that person in black and white. Shaking their hand or just talking with them makes them more…real ( if that makes sense). 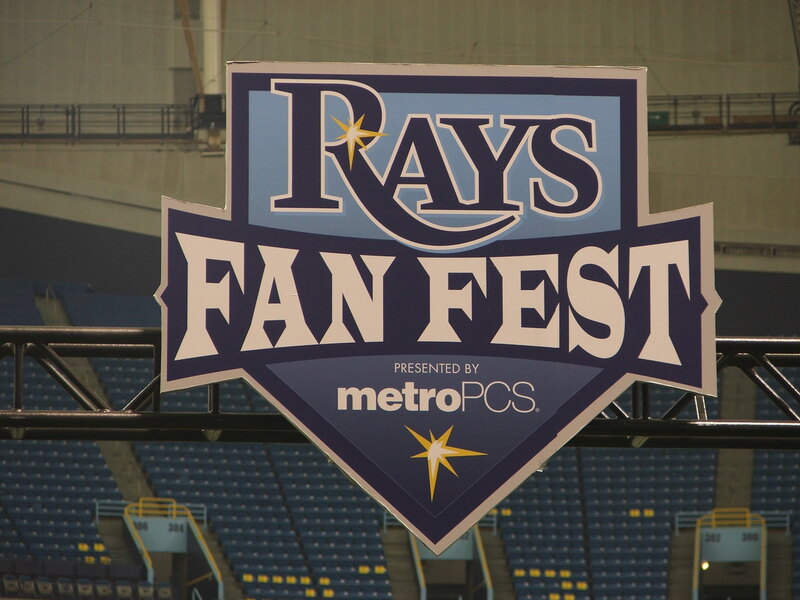 The Rays have done a great job again on Fan Fest, and it is one of those events I wait with anticipation…like a kid on Christmas morning….seriously. The pics really are outstanding. It looked like an incredible time. There is no way we do those kinds of things here. It’s a drawback of being US I guess. We can do something like the All*Star Game or an upcoming Super Bowl because we can disperse people everywhere in the city. These Fests are nightmares though. The only team that can do it well, and does, are the NY Rangers Hockey team. I wrote about the Cardinals Fan fest pricing a few days ago, and I am glad you did not take offense to me mentioning it. These events will not always be FREE or within the budget of most people. Maybe that is why I cherish them right now. 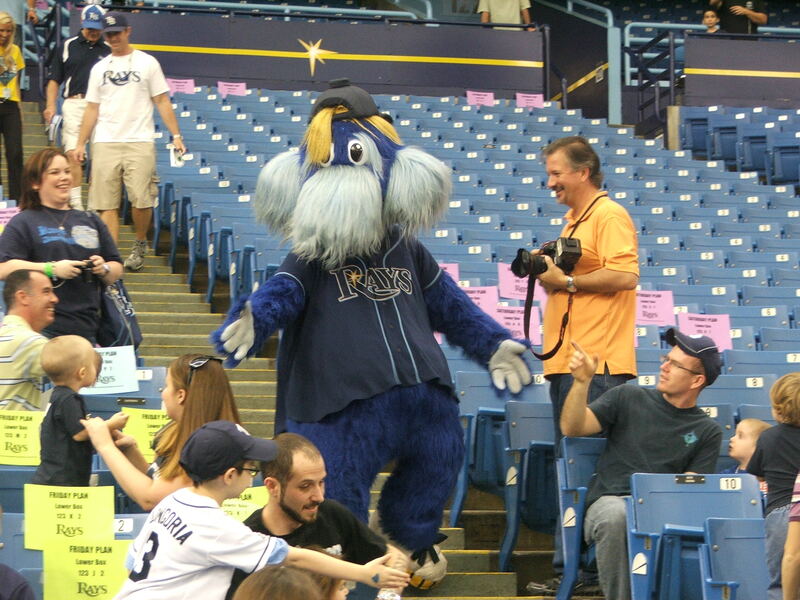 The Rays do seem to put their fans in front, which is a good and bad thing. Good because we get to do events or activities oither teams fans dream about..But bad becuase we may get spoiled and whine when they are gone. I can see a day in the future where even a Rays event might not be able to take place. But that will be when the current young kids get to become ticket purchasers and most of the transplants stay home or watch on television. It is a great event bar none. Dodger Blue seemed a bit less colorful without you during the off season..
Get ready for some Camelback fun, then a chance to knock some World Series glitter of those pesky G-men. Love the pics. Looks like you had a great time at the fanfest. You guys excited about Manny ? Oh yeah, thanks for coming over to my blog, yeah, i’ll be looking forward to retro t-shirt night. Thanks again for coming over to my blog. It was my pleasure coming over to your blog. I like to go out there and explore the blogs and see what kind of exciting writing is hitting the web. I actually met Manny this past Tuesday when he reported to camp ( by accident). I think he can do a lot with this team. Sure he might have a falre-up…or two, but that comes with the reputation. At least he is not Milton Bradley.